Next week I will share with you my best photos of 2010. This week I want to share with you what I feel is my best (ie., favorite) photo from my visits to Walt Disney World over the last year. It is not surprising the photo is from my favorite park, Disney’s Hollywood Studios, and from a show full of fast cars and explosions, Lights, Motors, Action! Extreme Stunt Show. 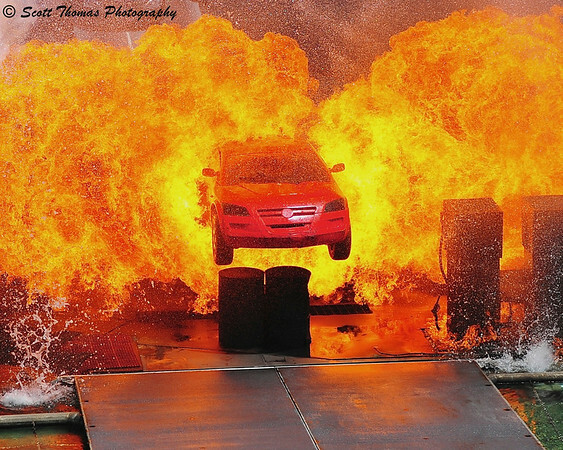 The Hero car jumps thru fire in the finale of the Light, Motors, Action Extreme Stunt Show in Disney's Hollywood Studios. Nikon D700/28-300VR, 1600s, f/6.3, ISO 200, EV -0.3, 92mm, cropped. This entry was posted in Travel and tagged car, disney's hollywood studios, explosion, fire, florida, hero, orlando, red, show, stunt, walt disney world. Bookmark the permalink. Fantastic! Can FEEL the heat! Glad you can as I must certainly did. WOW! What a spectacular scene. Shot on the exact time. Bravo Scott! Burst mode is a wonderful thing, Carsten. Thanks! This one’s an easy favorite… amazing shot! It stood out among a lot of good images from the Disney parks. It just had more of ‘it’ than those. I’ll be looking forward to your best photos, Scott! You sure got the timing right on this one! Thanks, Terry! It was tough to whittle down all the photos from 2010. I know an editor would have chosen differently. Oh dear….but great photo and colors! Oh dear? All is planned careful with safety first for the driver, crew and spectators. Wow, now thats a nice capture! Love that photo. Were you in the stands? I have been there and we were pretty far from the action. There is a VIP seating area I got to sit in last year. For this year, I found a place just behind the VIP area. It lines up great for the finale as well as anything in the center or left of center for the show. im new to word press, can u tell me how to make pics bigger? and how i add comments like this. Scott, I saw this yesterday at the Disney’s Hollywood Studio but sadly I didn’t aim my camera at the right spot. It’s difficult to get a good shot at this show since it happened so fast and this is a great shot.